In my last post, I included a number of photos of our cats, Chris and Puck, playing while Rose and I were wrapping Christmas presents. Somehow I managed to miss one of the pictures so I want to include it here. Next time I will try to pay more attention. 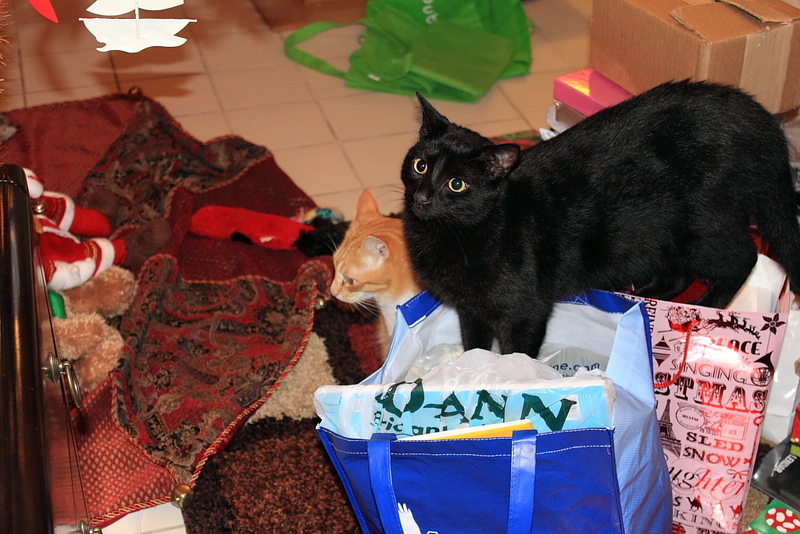 This entry was posted in Uncategorized and tagged Cats, Christmas, gifts, photo on December 14, 2013 by Charles Huss. Thanks. Merry Christmas to you too. They sure look like they’re having some fun! Puck is on the nice list. That’s all I’ll say about that. I like helpin’ with decoratin’ the tree, too. I don’t know a cat who doesn’t like decorating the Christmas tree. Next year I am going to save time and just put the tree up and lay the ornaments on the ground an let Chris and Puck have at it.